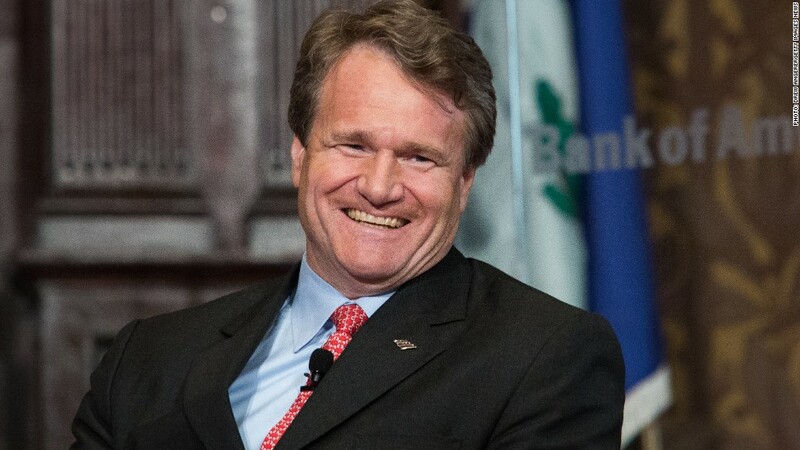 Bank of America boosted CEO Brian Moynihan's pay by 17% to $14 million. Bank of America is rewarding its CEO with a 17% jump in pay for 2013 -- to $14 million. CEO Brian Moynihan received about $12.5 million in stock grants, according to a regulatory form released Wednesday. He made $1.5 million as a base salary and did not receive a cash bonus. Moynihan received a total of $12 million in 2012. Bank of America (BAC) has staged a big turnaround since the depths of the financial crisis. The bank Moynihan took over in 2010 was saddled with bad loans and was facing an array of lawsuits. Now, it is on much more solid ground financially. Profits are growing. As a result, its stock is up some 300% since February 2009, when it traded below $4. A source familiar with compensation at Bank of America said that the Moynihan's base salary will stay the same in 2014. CNNMoney's Chris Isidore contributed to the reporting for this story.